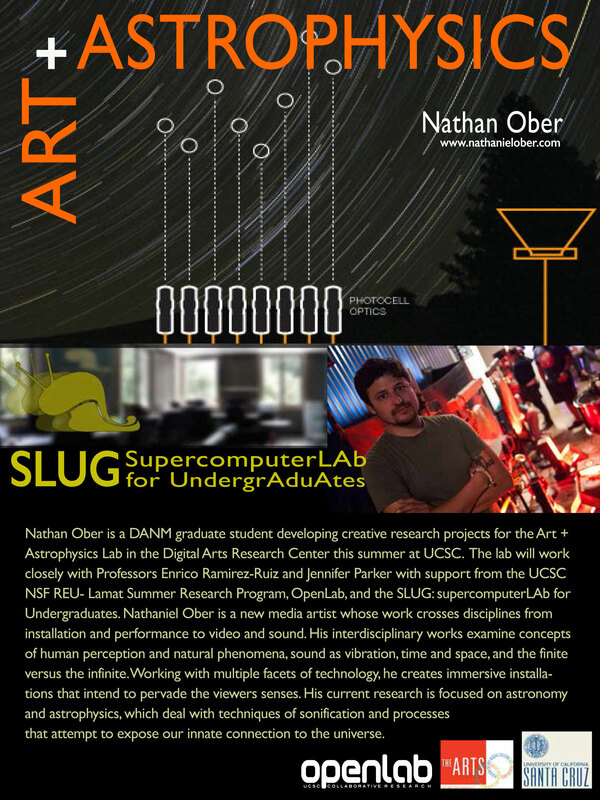 OpenLab: Art + Astrophysics Lab Nathan Ober is a DANM graduate student developing creative research projects for the Art + Astrophysics Lab in the Digital Arts Research Center this summer at UCSC. The lab will work closely with Professors Enrico Ramirez-Ruiz and Jennifer Parker with support from the UCSC NSF REU- Lamat Summer Research Program, OpenLab, and the SLUG: supercomputerLAb for Unergrduates. Nathaniel Ober is a new media artist whose work crosses disciplines from installation and performance to video and sound. His interdisciplinary works examine concepts of human perception and natural phenomena, sound as vibration, time and space, and the finite versus the infinite. Working with multiple facets of technology, he creates immersive installations that intend to pervade the viewers senses. His current research is focused on astronomy and astrophysics, which deal with techniques of sonification and processes that attempt to expose our innate connection to the universe.